He said the deal, which was approved by parliament last month and allows for the deployment of U.S troops and their military equipment in Ghana, was in line with previous international pacts and did not constitute an offer to Washington to establish a military base. Opposition lawmakers boycotted the vote after failing to block its approval, leaving members of the ruling party to ratify it. 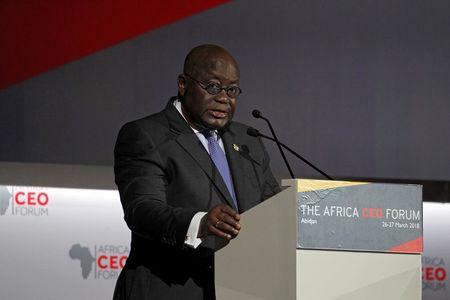 "It is our firm belief that the agreement will help enhance our defense capability, and offer an important layer of support in our common effort to protect the peace in our region," Akufo-Addo said in a televised speech. It was his first comment on a deal widely criticized by Ghanaians, including civil society groups and minor political parties. Thousands of Ghanaians last week protested in the capital Accra against the agreement, in a rare public display of opposition to a growing foreign military presence in West Africa. The deal will also allow U.S troops to use an airport runway that meets U.S. standards, and have free access to Ghana's radio spectrum. In return, the United States will invest $20 million in equipment and the training of Ghanaian troops. Akufo-Addo rejected assertions by critics that the deal would allow the United States to establish a military base in Ghana. "So let me state with the clearest affirmation that Ghana has not offered a military base, and will not offer a military base to the United States of America," he said. "Indeed, the United States of America has not made any request for such consideration and, consistent with our established foreign policy, we will not consider any such request," he added.